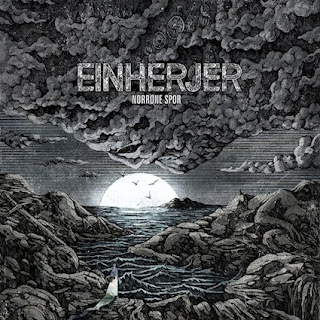 Norway's Einherjer have returned with a new recording which continues the viking/black metal style of previous releases and this is a review of their 2018 album "Norrone Spor" which will be released in November by Indie Recordings. A very hard and heavy sound starts off the album along with some blast beats a few seconds later while the vocals also bring in a great amount of grim black metal screams as well as the music also adding in elements of black'n'roll and all of the musical instruments sound very powerful. A decent amount of melody can also be heard in the guitar riffing while the solos and leads are also done in a very melodic style along with some viking chants and clear vocals being added onto some of the tracks as well as the riffs also bringing in elements of traditional metal, as the album progresses a brief use of clean playing can be heard and most of the music sticks to a mid tempo direction and they also close the album with a Motorhead cover. On this recording Einherjer goes into more of a mid tempo viking/black metal that is more closer to the modern Norwegian style, the production sounds very professional while the lyrics are written in a mixture of Norwegian and English and cover Nordic Mythology themes. In my opinion this is another great sounding album from Einherjer and if you are a fan of this band, you should check out this recording. RECOMMENDED TRACKS INCLUDE "The Spirit of A Thousand Years" "Kill The Flame" "The Blood Song" and "Av Djupare Rotter". 8 out of 10.